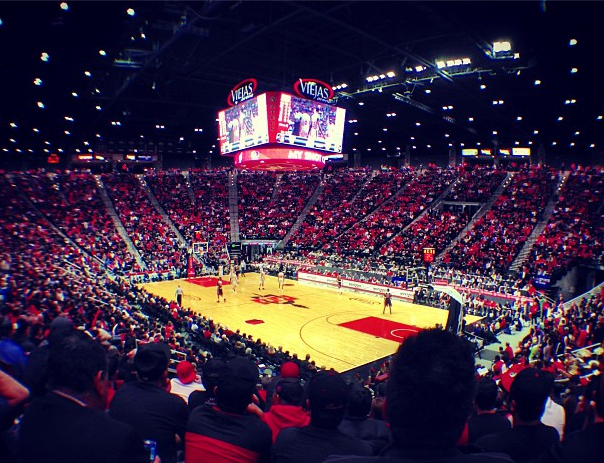 The San Diego State Aztecs will meet the University of Arizona Wildcats Thursday night before a sold out crowd (12,414) at Viejas Arena on the Campus of San Diego State University. The starting five for the Aztecs will be JJ O’Brien, Josh Davis, Skylar Spencer, Winston Shepard and Xavier Thames. The Wildcats have some height on the roster in freshman Eric Conklin 6-6, junior Chris Johnson 6-6, freshman Rondae Holis-Jefferson 6-7, sophomore Brandon Ashley 6-8, freshman Aaron Gordon 6-9, junior Matt Korcheck 6-10 and sophomore Kaleb Tarczewski. Arizona is a legitimate top-five team, says Steve Fisher.They can hurt you in many different ways. I believe the score of the game will be in the mid to high 60’s. San Diego State this season will live in the low to mid 70’s. If the Aztecs score more than 70 points they will be unbeatable. 2) Only shoot 3-point shot’s that are open! 4) Attack the offensive boards. Getting the offensive/defensive rebounds against this strong Arizona team will be a major key to victory!!! Game information: Tipoff 7:05p.m. PT Viejas Arena in San Diego, California. We will be live Tweeting the game on our Twitter account @SanDiego_Sports like we do for every major San Diego State Sporting event. I know Arizona is very good. I think they can be beatable, especially in Viejas. Their freshman Aaron Gordon is their core, wait until he plays in Madness on the Mesa. He has not played in that environment before, guaranteed! (ie: NM last year – we took right out of their rhythm!). GO AZTECS!